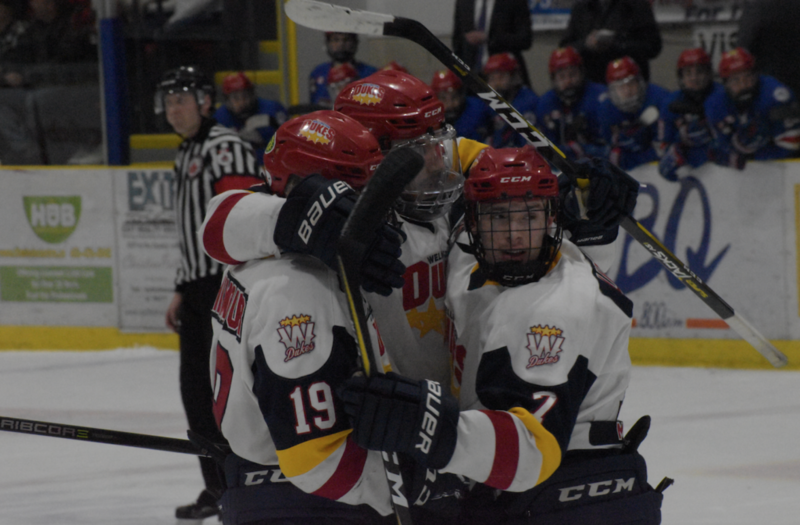 The Wellington Dukes have received a eyeful of how they other half lives in the Ontario Junior Hockey League and, thus far, the picture is not to their liking. 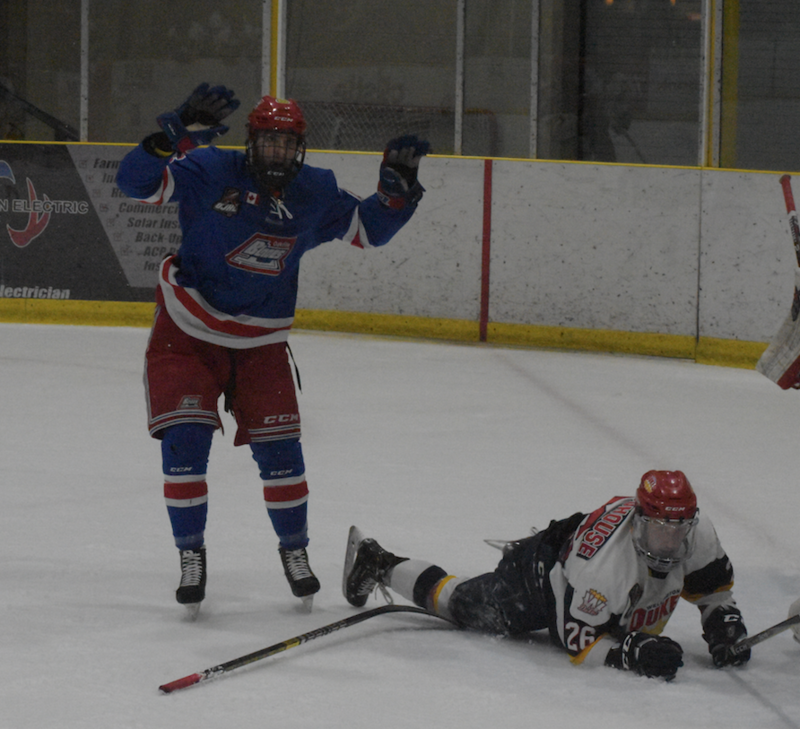 The Oakville Blades have staked themselves to a 2-0 lead in the 2019 Buckland Cup finals and the Northwestern Conference Champs are very much deserving of that early margin thanks to brilliant and determined play. That’s not to say Wellington has been completely outclassed through the entire 120 minutes of the first two salvos but it’s clear the Blades are very much deserving of their position as the number three ranked team in the entire Canadian Junior Hockey League. Up 1-0 in the seven game set, the Blades were able to double their lead through skill, determination and a little bit of puck luck on Sunday evening at Lehigh Arena. The Dukes would strike first in the contest as Tyson Gilmour fed Jacob Vreugdenhill on a nice 2-on-1 rush where the Belleville native was able to one time Wellington’s first goal of the series past Will Barber with just over six minutes left in the first. But Oakville’s crisp passing and quick skating stride was evidenced just over two minutes later as Tanner McEachern capitalized on Holden Dogget’s pass at the 16:50 mark to tie the contest at 1-1. Inside of a minute left in the opening stanza, Kyle Potts would bang home his 8th of the postseason to give the visitors a one goal lead heading into the first intermission. The Blades extended that lead early in the second. After a Wellington penalty was whistled, it only took the Blades 17 seconds of slinging the puck around the Dukes zone before Spencer Kersten found a wide open Peyton Reeves at 8:29 to make it a 3-1 lead for Oakville. 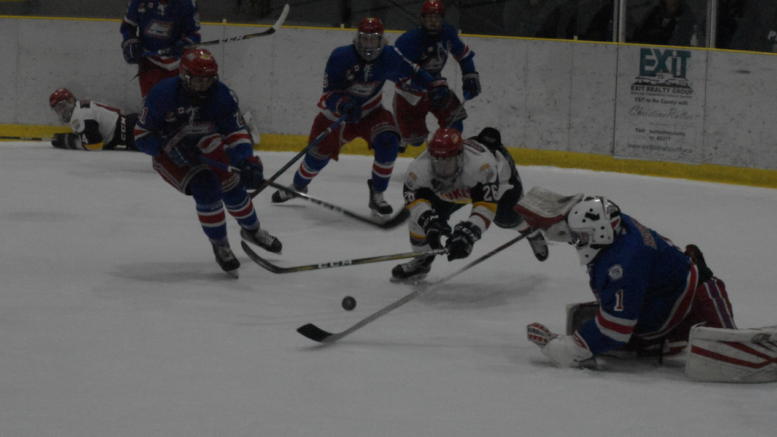 The Dukes would answer with a powerplay tally of their own later in the second however as Andrew Rinaldi manged to get the heel of his stick on a Quinn Hanna point shot that went through the legs of Barber and in the Oakville net at 13:57. In the third, the Dukes were able to tie it up as some heavy and sustained pressure in the Oakville zone resulted in their third marker of the evening, brining the nearly 1,000 patrons at Lehigh to their feet. Ben Woodhouse pursued a Zach Uens pass into the corner and was able to spot Frank Vitucci in high slot. Alone in front, the Yardley, PA native ripped a snap shot over the glove of Barber to make it 3-3 and it seemed like Wellington was back in the series. But a bouncing puck along the boards changed all that as Dylan Massie was whistled for tripping at 15:05. Given the liberal way the rule book was being enforced throughout most of the contest, it was a difficult minor penalty to see called inside the final five minutes of the game let alone at any point during Game 2. Once again Oakville wouldn’t need much time in which to work a solution with the man advantage. Just 34 seconds into the Massie minor, Kersten would get a stick on a Garrett Pyke feed, knocking it off the post and behind a screened Logan Bateman to make it a 4-3 edge in favour of the Blades. Wellington would get some offensive zone time late in the game but the commitment, tenacity and attention to detail shown by head coach Mike Tarantino’s club was on full display and, if the last two minutes of Game 2 are any evidence, it’s painfully obvious Oakville was a tough draw for any Northwestern Conference club in the playoffs this post season. Clogged shooting lanes, blocked hosts and pinned Dukes puck carriers were in plentiful supply down the stretch as the Blades engineered their way to a 4-3 victory in Game 2. The story in Game 1 was that the Dukes rarely had the puck over the opening two periods and the club had a tough time acclimating to both the olympic ice surface and the speed with which hosts attacked the Wellington end of the ice. Oakville would outshoot the visitors 22-13 over the opening 40 minutes and it was Kersten pacing the Blades attack with a pair of goals. Josh Nixon, Jack Ricketts and Christian Girhiny would also score to build a 5-0 lead for the Blades through two frames. Wellington would finally get going in the third and out shot the hosts but the Blades had the only goal as Alton McDermott beat Kyle Renaud who had replaced Bateman in the late going of the second period. Wellington will look get their game together in time for Tuesday’s pivotal Game 3 in Oakville on Tuesday evening. Ledes at Lehigh: Wellington was without pesky forward Elijah Gonsalves for Game 2 as the Toronto native is nursing a lower body injury…OJHL Commissioner Marty Savoy was in attendance for Game 2…Oakville forward Jason Pineo has yet to play in the series. He’s a player that won’t be able to play after the Buckland Cup should the Blades move on because of the Jan. 10 trade deadline fiasco…Much like the Dukes were able to do in the 2018 playoffs, Oakville has taken advantage of adding some Greater Ontario Junior Hockey League talent to the line up in the late stages of the playoffs. Girhiny has over 170 OHL games with the Erie Otters and has played for the Blades for exactly two games thus far…Meanwhile, Wellington would need to extend this series and hope the Niagara Falls Canucks are swept in the Sutherland Cup semi finals to see if 2018 stars Mitch Mendonca and Ben Evans suddenly become available. The Canucks are down 2-0 to the Waterloo Siskins but that series is scheduled on the same dates as the Buckland Cup final.